I am a food geek to the extent that I have cooking and baking goals. There are things I want to try, and I plot and plan for that some day when I'll have the time or the patience or the inclination to tackle them. French macarons were one of those things for many years. When the Martha Stewart's Baking Handbook was published back in 2005, one of the recipes she demonstrated from the book was French macarons. I already had to have the book, but when I saw that demo, I couldn't wait to have a look at that recipe. Then, over four years went by, and I never got around to attempting these little cookies. 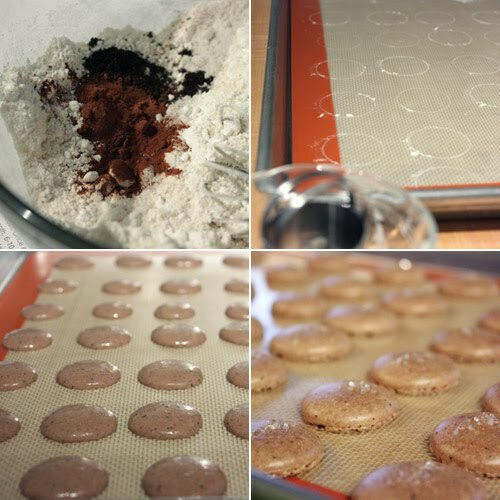 I've seen lots of other blog posts showing gorgeous examples of macarons, and I eavesdropped, so to speak, on Twitter conversations about baking macarons. Jamie from Lifes a Feast and Deeba from Passionate About Baking have created the MacTweets site that's all about macarons, and they encouraged anyone who hadn't attempted them before to go for it. I finally did it, and what you see here is my first ever effort. The suggested recipe on the MacTweets site is from Helen at Tartelette, and it is very similar to the recipe in the Martha Stewart Baking Handbook. I followed Helen's recipe exactly with Jaimie's suggestion for adding a little cocoa powder and espresso powder. I also heard from Jaimie that she uses pre-ground almonds rather than grinding them in a food processor, and I did that as well. So, the almond meal was whisked with confectioner's sugar, and then cocoa powder and finely ground espresso were added. Egg whites were whipped with granulated sugar, and then the almond meal mixture was folded into the meringue. I saw a useful tip in the Martha recipe for marking circles on a baking sheet by repeatedly dipping a one and half inch round cutter into flour and then pressing it on the silpat. Then, when piping the meringue, you have a guide for making the cookies all the same size. I was sure I owned some large, plain, piping tips, but when I went searching for them I found I only have star tips. I should take an inventory of my kitchen supplies. So, I went the cut a hole in a disposable piping bag route. The first hole I cut was, of course, too big, and the cookies spread a bit after being piped and I had to start over. The second time around, I made them very petite, inside the marked circles, and sprinkled a few bits of sanding sugar on top of each. I baked them at 280 degrees F, as instructed, and couldn't believe it when I saw that pretty, ruffled feet had formed. I followed Helen's instructions for making a vanilla buttercream, and can I pause for a moment to dwell on the silky deliciousness that was that buttercream? One more moment. After letting the macarons cool, and then ever so gently peeling the silpat from the backs of them, and seeing a few of them crack and shatter, I filled the rest with that buttercream. For a touch of holiday spirit, I rolled the edges of exposed filling in crushed candy cane pieces. These cookies are a fun challenge in the kitchen, and the possible flavor combinations are endless. I don't think they'll ever become my favorite cookie to eat, whether I've made them or purchased them. They are light with a barely there crunch on the surface and a hint of chewiness, and the filling was extremely good, but they're also a little on the sweet side even for a cookie. I am thrilled, though, to have finally made French macarons and the experience has only increased my respect for those bakers who make them look so colorful, delicious, and effortless. CONGRATULATIONS!! they are so pretty. Oh god how cute!! Yum!!! I could so go for some of those, at this very moment. Only bakers will understand the excitement of seeing your macarons develop feet. If I were to write an autobiography, it will be divided into two parts: my life before and after my macarons grew feet. These little gems look so pretty and I believe you when you say they're extremely good. Oh la la ... Lisa, those are my favorite cookies ever! I better make these treat for Christmas soon. Lisa, you make very beautiful macarons!! These looks absolutely gorgeous. They're one of the things I've been meaning to get around to, and you've given me incentive. What perfect macarons! They look so tempting! Thanks so much for playing along with us at MacTweets and for not getting mad at my ribbing and pushing! And look! Perfect macs! Congratulations! I must make this buttercream next time I make chocolata macs, you make it sound so perfect! And love the crushed candy canes! Stunning! These macarons are calling my name. They look absolutely gorgeous! Great job. Wow I cant believe you did so beautifully on your first time. I have finally made good macaroons on my 7th try. I am slightly jealous of you now but maybe if you share your macs with me, I will be okay with it. O my god Lisa; if this is your first attempt I bow to you!! I am making macarons as we speak and they are drying now, but this is my 5th (I think) attempt!! I have had one succes out of those previous 4 and my hopes are high for the current batch. It looks good sofar! I am gonna make the buttercream myself as well so can't wait to try them! this looks very Christmas-y...I love this! Lisa, you've got perfect macs the first time itself! And they look so pretty too. I am yet to post mine. Lookin' lovely these macs! 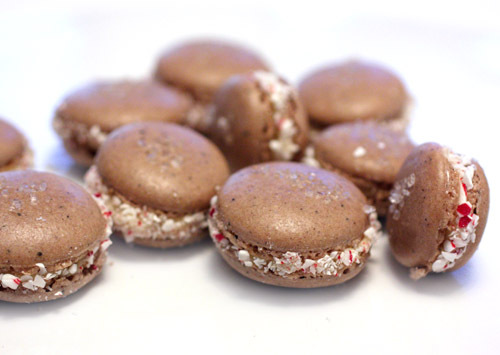 I'm going to steal the crushed christmas candies idea for some macaroon baking at my annual christmas cookie party! i still haven't made macarons. they don't excite me. at least, they haven't until now--this particular combination (especially the roll in candy canes) is irresistible to me. excellent work, lisa. Beautiful. I have never made macarons before. Wow, you have conquered, they are beautiful and goals are good...any kind of goals. Oh my gosh, I'm staring at heaven and its staring right back at me. Way to go! wow! so gorgeous and delicious looking! ive never had the courage to make macarons :) have you seen the macaron post on mowielicious? Congratulations Lisa! Great (amazing really) first effort. I am afraid to make macarons. I think I just need a long afternoon and maybe a glass of wine. These turned out perfect Lisa! So beautiful. I love the flavors! And they look very festive. The crushed candy cane edges are a very nice touch. They're pretty enough to hang from the holiday tree. Your first ever effort was spectacular, Lisa! They are picture perfect! And I love the peppermint trimming! Beautiful cookies, and I love the crushed peppermint on the sides. I am bookmarking this one. You did an amazing job on these! They look perfect in every way, feet, color, crushed mints and all. Very impressive! They are gorgeous and what a great idea to roll the filling in the candy cane pieces, so festive for the holidays! I'm so impressive you made gorgeous macs on your first try! Fun idea to add the mint for the holidays! What a great first attempt! These are beyond beautiful!! Congrats!!!! Baking macarons have been on my list of "Things to Bake" forever...but I really can't measure up to yours! They look absolutely PERFECT! Waw,...Lisa!! You are certainly one of the macarons queens!!! Your macarons are so gorgeous!!! Look very pro! Hi! My name is Gillian and I work for Cedar Fort, a Publishing Company. We publish tons of cookbooks (you might have heard of 101 Gourmet Cupcakes in 10 minutes). I do the blogs for the company and have started up a recipe blog. I loved all the recipes on your blog- and was wondering if you would like to do a little exchange with me? I could give you a recipe from one of our cookbooks for you to share, and you could share one of your favorite recipes with us. Would you be willing to do that? If you are, my e-mail is gmohmlan@cedarfort.com. I would love to hear from you! Thanks! Great Blog btw! Your macarons look just perfect! They look so perfect and I love the crushed candy canes on the outside! Congratulations on achieving feet!!! They look delicious! These look great! I recently wrote a post about Macarons and am suddenly discovering loads more interesting recipes and info around - like your post. They baked up beautifully - well done. I have seen a lot of macaroon's around food blogs...is there a macaroon holiday I am unaware of? :) Yours are unique with the candy cane, and chocolate would be my choice! They look amazing. The feet are perfection. It looks like you got it just right. I love the combination of flavors you picked, too. Happy holidays! 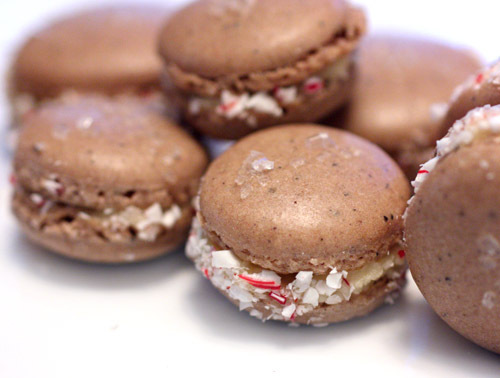 Lisa, your macs turned out gorgeous, and I love the chocolate, peppermint candy cane combo. Your photos are beautiful too..nicely done as always! Have a wonderful holiday!